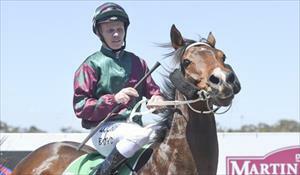 Apprentice jockey Anthony Boyd knows better than most the importance of timing a run to perfection. The 29-year-old, who is indentured to Flemington trainer Danny O'Brien, had all but given up on a career in the saddle in mid-2013 after his weight ballooned to 77kg, rendering him unable to continue riding on the Victorian picnic racing circuit. But determined not to miss what he felt was his final chance to follow in the footsteps of his uncle, successful country jockey John Hunter, Boyd threw himself into a life-changing fitness regime that saw the father of three strip down to 52kg and earn a place in Racing Victoria’s Apprentice Jockey Training Program in January this year. It was a well-timed move that would change Boyd’s life. The Ballarat-born hoop has flourished within the Apprentice Jockey Training Program, out-riding his three-kilogram provincial claim within four months of resuming professional race riding in March. As such it seems appropriate that Boyd was the man to pilot the Mandy Shillito-trained Chantilly Milly to yet another perfectly-timed victory in the $16,000 Wilson Medic One Rising Stars Handicap (1600m) at Werribee on Tuesday. After drawing wide, Boyd allowed the four-year-old Dane Shadow mare to drift to the rear of the field before angling wide on the turn. Chantilly Milly required every metre of the Werribee straight to reel in tearaway leader Gee Whizzer, hitting the lead in the shadows of the post to record a 0.75-length victory in what was the eighth heat of the apprentice-only Rising Stars Series. Boyd said he was thrilled to secure his first win for the series this season after experiencing an extended period away from the track with a hand injury. “It was a really good result,” he said. “This was my first ride for (Mandy Shillito). The win was Boyd’s 24th since he began his professional riding career in Victoria in April this year and rocketed the first-year apprentice to third on the 2015-16 Wilson Medic One Rising Stars leaderboard, seven points shy of overall leader Jack Martin (25 points). Harry Coffey, who finished second on Tuesday aboard Astrolabe, is just two points adrift of Martin in second place on 23 points.